Sam Tonge is a recent graduate of Royal Holloway, University of London with a Bachelor’s of Science in Geography. During is studies he volunteered with Thames21 as a Training Programme Assistant of the Event Support Team and went on to lead his own riverside clean-up project through a partnership with his university and Thames21. Here, he tells us about how his time with Thames21 has developed his leadership, organisation, and communication skills and led him to a position of Project Officer with a national charity. I first began volunteering with Thames21 back in 2015, during my second year studying Geography (BSc) at Royal Holloway, University of London. Being passionate about local sustainability and wishing to develop my skill set, I decided to undertake the Thames River Watch training, which provided me with knowledge of how ordinary citizens can provide regular measurements of tidal river water quality. I enjoyed measuring the water characteristics at my regular site at Richmond-upon-Thames, which allowed me to learn how each and every one of us can work together to monitor and improve the physical health of London’s rivers. This focus on communities inspired me to learn more about how Thames21 engages with volunteers at public clean-up events. Undertaking the NCFE-accredited Leading a Waterway Clean-up course provided me with the knowledge of how to effectively lead volunteer groups and how to act as an ambassador for Thames21 as part of the Event Support Team. 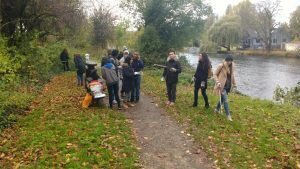 Shortly after the training, my university’s Students’ Union posted a vacancy for a leadership role in a riverside clean-up project in partnership with Thames21. I immediately applied for this volunteer role, seeing it as an ideal chance to put into practice everything I had learned through leading my own group of volunteers. Being responsible for the success of the project provided me with a great deal of useful skills and experience which have opened up a whole host of new doors for me, as a student finishing university. Coordinating all aspects of termly volunteer clean-up events required a great deal of self-motivation, determination, and the ability to manage volunteer work with university study. 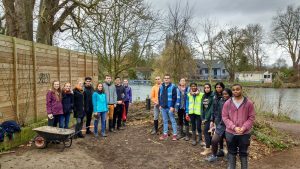 Delivering an effective promotion campaign for our events paid off with an average of 12 students volunteering their time throughout the year to make a difference to our local site in Staines-upon-Thames. Before this role, I had never imagined myself in a leadership-based position, often thinking of myself as more of a follower than a leader. However, putting into practice the skills I learned during my time training with Thames21 has been a life-changing experience, allowing me to develop confidence in communicating with diverse groups of volunteers within the community. Managing a conservation group also proved to be extremely useful when applying for internships, as the transferable skills such as leadership, organisation and communication developed through my role showed that I was well-rounded as a graduate and willing to go the extra mile in pursuing my passion for local sustainability. My journey with Thames21 continued as I began my role as a Training Programme Assistant, helping the organisation deliver an exciting and diverse range of training courses. This hands-on volunteer placement has allowed me to take on really exciting responsibilities, including drawing on my experience as a Thames21 Badged Group leader to develop an introductory training booklet for new volunteers. Although this has been my main project in the role, it has been carried out alongside a diverse range of experiences, including inputting information to a centralised database, communicating and liaising with trainees via the online booking system and providing feedback on trainee assignments. Being in this role for nine months while studying meant that I gained a lot of transferable skills which have helped prepare me for the ‘real world’ of employment. Such a diverse collection of volunteer experiences has been an extremely rewarding journey. I’ve really enjoyed meeting so many new people within my various roles. Such experiences have also allowed me to demonstrate my passion for sustainability to potential employers, providing me with professional experience for my CV and interviews. The development and mentoring I’ve experienced at Thames21 means that I’ve gained more confidence in communicating and sharing the many skills I’ve learned through my volunteering in a wide variety of contexts. As a result, I’ve recently been offered a paid Project Officer role with a national sustainability charity. I’m really excited to be starting in my new role very soon, where I will be able to develop my passion for sustainability in a much increased capacity. I will always be grateful for my time at Thames21 and how it has contributed to my personal and career development, and although I will now be in a full-time position, I still hope to continue volunteering as a member of the Event Support Team on weekends.